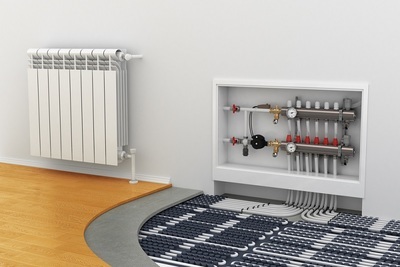 Hydronic heating systems provide the required warmth to a home by the pumping of hot water to the under-floor tubing, radiators and to heat exchangers. This system is beneficial in more than one way. Besides being cost-effective, they provide even distribution of the warmth. This might not be possible with the other heating systems. As these are considered safe, they tend to be a preferred choice. The air provided by these systems is considered as ‘healthy’ without any allergens or dust. It is important to call in the professionals to maintain the hydronic heating system of your home, so that you can stay in a germ-free environment. Before you face a specific problem with these heating systems it is advisable to opt for preventive maintenance. This can include flushing out the total used water and using clean water. The pilot and the burners should be cleaned at this time. The boiler casing needs a visual inspection for any signs of damage or other problems. This can be done on a seasonal basis. This inspection includes problems with the condensation, combustion, overheating of the boiler and any signs of leakages. After which the burner gas train and the burner sections are inspected. Any corrosion or deformations are looked into. Improper combustion is looked into. The system safeties are inspected and the cutoffs might be repaired or replaced according to the requirement. Neglecting the furnace or the boiler can lead to problems with these heating systems. These need to be checked for any rust or calcium deposits. Any one of these puts pressure on the boiler. The calcium deposits can be dissolved with the use of specific chemicals. Souring off the rust and patching up of any holes is necessary. With the maintenance of the boiler done at the appropriate time, you can look forward to a boiler which can last to almost 25 years without any problems. Maintaining these heaters in the right manner can be beneficial in many ways. The energy efficiency factor is taken care of and you save on the money spent on the utility bills. The other benefits you can look forward to are even heating in your home according to your requirement, durability and the comfort levels of the inhabitants. You must ensure that they are well –reputed. Generally, people choose the professionals from the local areas, to avoid any additional cost. At the same time, if you are searching for the companies online, then you can go through the reviews and testimonials. Choose professionals who have enough and more experience in the servicing of heaters. Commercial and domestic heating system specialists are different so you choose the hydronic systems maintenance expert accordingly. Ask for professionals who have a thorough knowledge of how these hydronic heating systems work. Inquire whether they charge you nominal charges and offer some sort of warranty for their servicing. Either look out for these service suppliers online or ask around from family and friends. Checking online works out an easy option but make sure to read the different reviews provided by the previous customers. This assures that the servicing is done in the right manner and you are saved from any uncalled for problems in the near future. Take some time and make an effort so that you are benefitted with the heating system. Can you please replace the hyperlink on anchor text with http://www.geoclimate.com.au/hydronic-heating.html.